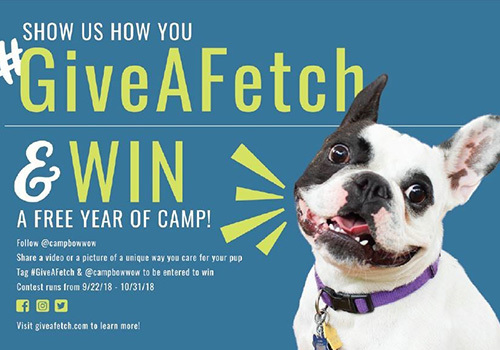 Camp Bow Wow, the nation's largest Doggy Day Care and Boarding franchise and leader in the pet industry, is announcing the return of its national #GiveAFetch campaign after a successful and exciting inaugural first year. The $100+ million-dollar company created the multi-dimensional activation to promote being a responsible pet parent and community member while celebrating the special things we do for our dogs. Between Camp Bow Wow's country-wide franchises and the company's corporate team, the goal of this fun, dog-friendly initiative is to engage all clients, community members and dog lovers across the nation to show why we all #GiveAFetch about our furry friends. Camp Bow Wow's second annual #GiveAFetch campaign will kick off National Dog Week with yet another full weekend of interactive events on Saturday, September 22nd and Sunday, September 23rd in four city parks across the country. The brand has chosen lucky cities, Pittsburgh, Dallas, Las Vegas and Kansas City to host the entertaining, dog-friendly events aimed at furthering Camp Bow Wow's commitment to ensuring all dogs lead happy, healthy lives. As part of this activation, 7 ft. tall tennis ball dispensers holding over 2,000 balls will be popping up across the country in the selected parks. Forevery ball dispensed, Camp Bow Wow will donate $5 (up to $10,000 per event) to a local shelter of the user's choice. The dispenser also doubles as a photo booth and the one lucky winner who receivesthe "golden tennis ball" will win a free year of Camp. In addition to the giant dispenser, attendees will enjoy on-site adoptions through local shelters/rescues, food trucks, local vendors and other activities, including free dog "paw-traits" from a caricature artist. "With last year's #GiveAFetch events bringing so much joy across the country, we couldn't wait to do it again. This unique initiative is a fantastic way of promoting our longstanding commitment to responsible pet ownership. While we value our pets throughout the year, we truly love being able to kick off National Dog Week in such a special way, garnering further awareness to our furry friends, both with a home and without," said Julie Turner, Camp Bow Wow's Vice President of Marketing. Starting from the kick-off weekend through October 31st, Camp Bow Wow is also encouraging pet parents nationwide to participate in the social media contest. By posting photos on social media using the hashtag #GiveAFetch, pet parents will have the opportunity to share how they go the extra mile to make their pup's tail wag. Whether it's throwing their pooch a birthday "paw-ty" or cooking a special holiday meal, the winning submission will receive a free year of Camp. The second annual #GiveAFetch program is a testament to the brand's #1 rank in the pet care category in Entrepreneur's Franchise 500 list for the last three consecutive years and inclusion in Entrepreneur's 2017 and 2018 Best of the Best Lists. The company is dedicated to serving as a trusted resource while pet parents are away or at work by providing dogs with a happy, safe place to play while simultaneously offering socialization, exercise, love, TLC and more from Certified Camp Counselors. Just as the Camp Bow Wow team successfully executed the events last year, with the parks attracting over 4,000 attendees nationwide, donating thousands of dollars to local shelters and helping 58 dogs find their fur-ever homes, the company continues to exhibit its commitment to inspiring pet lovers across the country. For more information about #GiveAFetch, details on the event in your area or social media contest, please visit GiveAFetch.com. For more information about Camp Bow Wow, or to become a franchise owner, please visit campbowwow.com or campbowwowfranchise.com.